The Arnold P. Gold Foundation joined with Planetree at its 40th Anniversary International Conference on Person-Centered Care, a dynamic gathering of advocates of compassionate care. 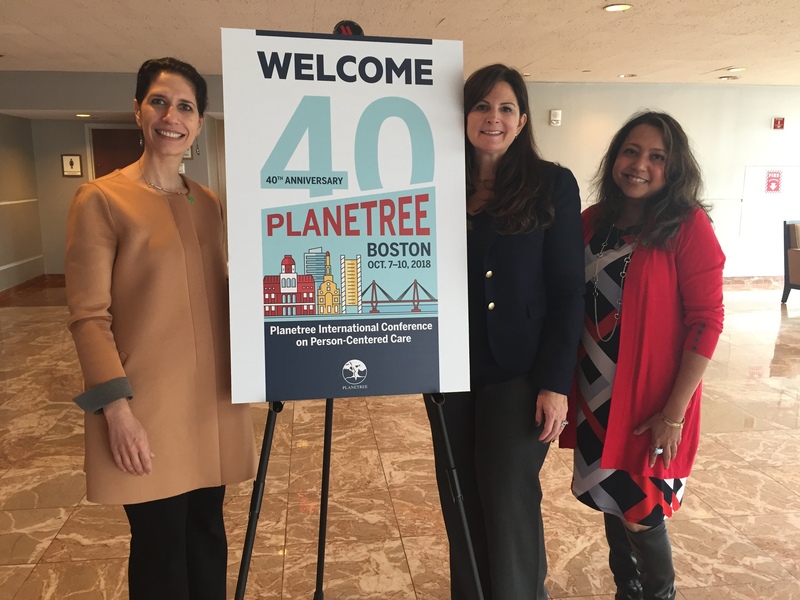 Held October 7-10, 2018, the event in Boston marked the first time the Gold Foundation contributed a significant presence at Planetree’s annual conference, with sessions featuring Gold Foundation leaders, grantees and supporters. 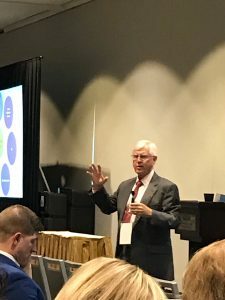 The 2018 conference laid the foundation for a 2019 conference that will be jointly hosted by Planetree and the Gold Foundation in Orlando, Florida. The 2018 Planetree conference kicked off Monday morning, Oct. 8, with a talk by Dr. Levin focusing on the legacy of Dr. Arnold P. Gold, the foundation’s namesake, and why his call to humanism is more important than ever. The talk include a short video of Arnold’s life. Dr. Levin then explained how Arnold’s vision of the human connection in healthcare has been increasingly challenged. Technological progress has been stunning and helped so many patients. The Gold Foundation emphasizes that care must be collaborative, compassionate and scientifically excellent. All three aspects are crucial. 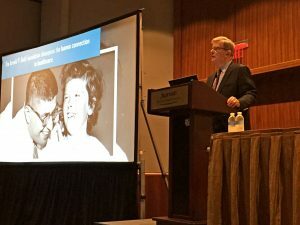 Dr. Richard I. Levin, President and CEO of The Arnold P. Gold Foundation, presents “The Gold Foundation and Arnold Gold’s Legacy: Why Humanism in Healthcare is More Important than Ever” during the 40th Anniversary of Planetree International Conference on Person-Centered Care. Tuesday, Oct. 9, continued with three Gold-related sessions. Dr. Kimberly A. Fisher, Assistant Professor of Medicine at University of Massachusetts Medical School, presented her research on patient perceived breakdowns in care. 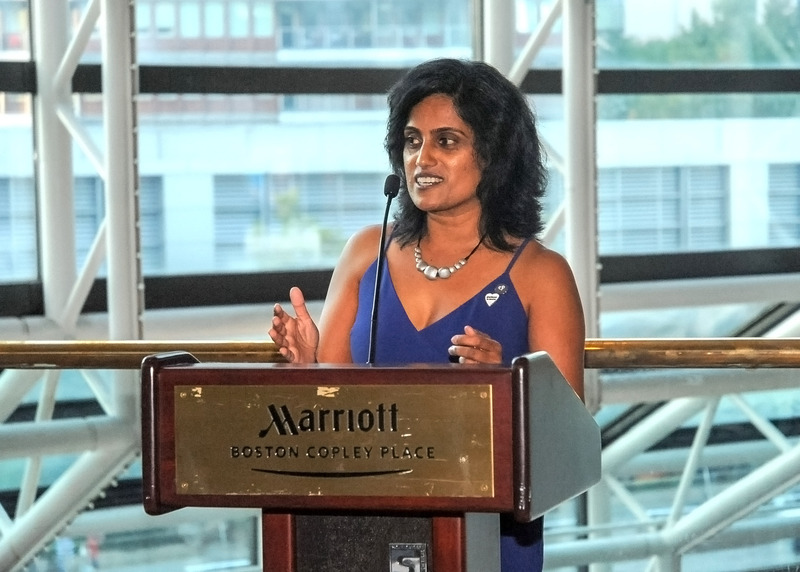 UMass Medical School is a member of the Gold Partners Council, a consortium of medical schools committed to advancing humanism in medicine and conveying to the healthcare professions and public the importance of Keeping Healthcare Human. Dr. Fisher’s research finds that many times patients notice a breakdown in care but do not report it and examines the possible reasons. In one study, published in the Journal of Hospital Medicine, 39.4% of nearly 1,000 patients surveyed they had experienced at least one breakdown in care. Who asks and what happened matters: research by Dr. Fisher and her colleagues shows that if a patient advocate inquires, patients are much more likely to say they “would definitely mention” a rude aide or slow response time than if a physician asked. Having a family member present also makes a difference. The study found that patients said they would report a breakdown in care 38% of the time when they were alone, but 53% of the time when they were with a family member or friend. Dr. Fisher also noted there are some simple ways to help address such breakdowns in care, and apologies can be helpful for patients who do speak up. Read more about Dr. Fisher’s talk here. On Tuesday afternoon, the Gold Foundation and Quest Diagnostics presented a session on Tell Me More® strategies. Quest Diagnostics is a founding member of the Gold Corporate Council, an alliance of leading healthcare corporations that have come together to elevate humanism in healthcare, both within their own organizations and in the broader healthcare community. Quest Diagnostics has partnered with the Gold Foundation to implement a customized version of Tell Me More®. Tell Me More® helps patients and caregivers to get to know each other beyond their diagnoses and job descriptions. It can be implemented in a variety of ways, including as simply – yet powerfully – as a sign on a wall in a patient room that lets the patient share a few personal details, which illuminates him or her as a person, separate from their illness. Elizabeth N. Cleek, Chief Program Officer of the Gold Foundation, and Pia Pyne Miller, Director, Humanistic Healthcare Strategy presented how Tell Me More® is utilized in care and corporate settings to elevate connection. Nora Branconi, Executive Director, Customer Service at Quest Diagnostics, shared how Quest has incorporated Tell Me More® into its Everyday Excellence program to encourage employees to connect with their customers. For example, a phlebotomist drawing blood from a patient might be attuned to a shift in a patient’s mood and tap into her training in Tell Me More® to ask if everything is OK.
“As we gave people these tools, we wanted them to find their way back to why most people came to Quest Diagnostics: They came here because they wanted to make things better, they want to help people have a better life,” said Ms. Branconi. Finally, Tuesday’s Gold sessions were capped off with a presentation by Picker Gold GME grantee Dr. Juliette Perzhinsky, Associate Professor, Central Michigan University College of Medicine. Dr. Perzhinsky received a Picker Gold grant to support her creation and implementation of an interprofessonal training designed to optimize mental health care for patients managing chronic pain with opioids. She shared her learnings so far in this important work. Dr. Perzhinsky was also a 2017 Gold Humanism Scholar at the Harvard Macy Institute for Program for Educators in the Health Professions. As a clinician, Dr. Perzhinsky was caring for patients who were managing chronic pain with opioids and noticing that many had underlying or undiagnosed mental health conditions. She pointed to statistics that show 25% of patients have a mental health condition – over 43 million. “Further complicating that is that 50% of U.S. adults will actually develop a mental health condition in their lifetime,” she explained. Through this initiative, Dr. Perzhinsky is helping trainees work collaboratively across professions and with patients to better care for and understand the complexities that are involved in chronic pain management, particularly as it is co-morbid with mental health conditions, such as depression or anxiety. With the funds from the Gold Foundation’s Picker Gold grant, Dr. Perzhinsky and her team developed five interactive sessions of interprofessional trainings, along with pre- and post-curriculum assessments. Wednesday started bright and early with a talk at 8 a.m. on “Starting a New Medical School: How We Focus on Teaching Empathy, Communication and Self-Reflection” by Dr. Lawrence Smith, Founding Dean of the Zucker School of Medicine at Hofstra/Northwell and Executive Vice President and Physician-In-Chief, Northwell Health. Dr. Smith is also a Board member of the Gold Foundation. Dr. Smith envisioned a radically different structure to the new Zucker Medical School, which opened in 2011. In studying how to create a curriculum in the 21st century, they learned that there was almost no retention two years later from what was taught in the first two years of medical school. “We decided that this device had made memorizing things obsolete,” explained Dr. Smith, holding up his cell phone. “We designed – with the help of many, many scientists and clinical specialists – a curriculum that never required memorizing anything, but demanded that you understood the concepts of science at a sophisticated enough level that when you saw a patient, you would apply those principles to solve the patient’s problems. And you could do that on your own, with coaching from faculty, but not with teaching from faculty,” he explained. It requires that you take the scientific basis of health and disease and put it into action as oppose to just know it. And you have to be able to build a relationship of trust in order to collaborate with that patient and have them ever trust you to do anything that you suggest might be appropriate for their health. This groundbreaking approach to medical training begins at Zucker School of Medicine in the very first weeks, when students go through a course to become certified Emergency Medical Technicians (EMTs). This unique experience transforms them from bystanders to active participants, and places them in real situations that demands teamwork and gives them appreciation of the many roles of healthcare professionals involved in patient care. This inspiring work and focus on caring for the patient continued with a final Gold session on Wednesday afternoon, by Dr. Dinali Fernando. Dr. Fernando is the Medical Director of Libertas Center for Human Rights, Elmhurst Hospital Center; Attending Physician, Department of Emergency Medicine, Elmhurst Hospital Center; and Assistant Professor, Icahn School of Medicine at Mount Sinai. Based in Queens, New York, the Libertas Center provides medical, psychological, social and legal services to meet the complex needs of patients who were tortured in their home countries and are seeking refuge in the U.S. Under Dr. Fernando’s leadership, the Libertas Center has grown from a volunteer program to a multi-disciplinary treatment center and national leader for this underserved population. In recognition of her ground-breaking work, the Gold Foundation awarded Dr. Fernando the 2018 Pearl Birnbaum Hurwitz Humanism in Healthcare Award. 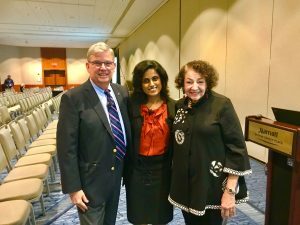 At the Planetree conference, Dr. Dinali Fernando led a session on the hidden population of torture survivors in the U.S. and their particular care needs. Her presentation was wide-ranging, and included concrete details on how healthcare professionals can care for this population as well as guidance on the organizational level around outside collaboration, worker safety and well-being, and best practices for follow-up. She underscored that this population has special health needs and requires holistic care to help them feel healthy, safe and whole again. Dr. Fernando shared recommendations for an initial meeting with a patient who has such a background, including assessing their current support systems, needs in all domains of care (medical, mental health, legal and social services), and what they view as their most urgent needs. Dr. Fernando also shared general principles to help elicit a patient’s history. If a healthcare professional notices scars during a physical exam, that offers an opening to learn more. “If you ask them, they will tell you, but you have to take the time to ask them,” she said. She emphasized that recounting the events of abuse can be very stressful and potentially re-traumatizing for the patient, as well as difficult for the interviewer to hear. “You have to know when to nudge them to open up to facilitate their healing, but be gentle. The whole process takes time,” she said, adding that patients may get dates and times confused, but that this is not uncommon. Patients may have had traumatic brain injuries or PTSD which can affect their memory and concentration. She also advised special care in any physical examination: to begin with the less intrusive elements, to avoid prolonged nakedness, and to explain each step. Alternative therapies such as photography, dance or art, can also provide benefits, allowing patients to express themselves in novel ways and rediscover their voice. Through all of its work, which also includes legal and social services, the Libertas Center has seen measurable improvement among its clients. And more than 90% of clients with an affidavit provided by the Libertas Center experienced a positive outcome in their immigration case. Read more about Dr. Fernando’s work. 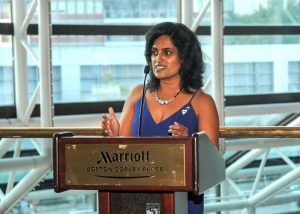 Dinali Fernando, MD, MPH, 2018 Pearl Birnbaum Hurwitz Humanism in Healthcare awardee, giving remarks during the reception held in her honor. On Wednesday evening, the Gold Foundation hosted a special reception to honor Dr. Fernando and her important work at the Libertas Center for Human Rights. It was attended by Dr. Ron Arky, a Harvard professor whose generous support and enthusiasm led to the creation of the award; Dr. Sandra Gold, Board member and co-founder of the Gold Foundation; Jonathan Seelig, grandson of Pearl Birnbaum Hurwitz; Ed Burleson of Henry Schein, a Gold Corporate Council member, and many other healthcare leaders and supporters. The conference closed with a remarkable awards ceremony that honored the many hospitals and medical centers who have worked to become Planetree certified or participated in another noteworthy way. At the ceremony, Dr. Levin officially presented the 2018 Pearl Birnbaum Hurwitz Humanism in Healthcare Award to Dr. Fernando. Please join us next year as Planetree and the Gold Foundation join forces in a remarkable conference in late October 2019 in Orlando. More details will be forthcoming in early 2019.